A sighting of a UFO was made in the 1880s by miners-turned poachers at Padeswood, near Mold, who were disturbed by a "swirling ball of smoke with tongues of flame". Richard Holland explains... 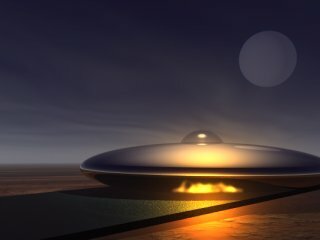 It's a common assumption that the UFO is a modern phenomenon belonging to the Space Age, but this is not the case. Strange lights in the sky have been causing conjecture for centuries. According to Buckley historian James Bentley some striking coal miners encountered what today we would call a UFO way back in the 1880s. Mr Bentley heard the story from relatives of two of the eye-witnesses. It seems that, starved of wages and therefore of food, a gang of miners dared to risk poaching on land belonging to one of the mine owners. If they had been caught it would have meant eviction, and possibly transportation which is why the following story was kept under wraps for so long. One dark moonless night the miners crept down to some fields at Padeswood, near Mold, to collect some snares previously left there. Suddenly they felt tense and afraid, as if someone was watching them. Glancing up, they saw a large, purplish-red luminous ball hovering above them! Silently it descended into the next field. At first the terrified poachers hid their heads under their nets but shortly, on feeling a lessening in the tension in the air, one of their number dared to peer over the hedge. A "swirling ball of smoke with small tongues of flame issuing from the base, was lifting off the ground". The men ran home and vowed each other to secrecy. Several days later the bravest of the bunch returned to collect the gear they had left behind in their panic.